The Golden Gate Bridge, the Painted Ladies, Alcatraz…and no list of the iconic images associated with San Francisco would be complete without the cable cars. They are one of our city’s most popular tourist attractions and have been considered special “moving” National Historic Landmark for more than 50 years (per The San Francisco Cable Car Website). Yet, many are unaware of the extent of the problem of cable car accidents. Having served the California legal system since 1996, Attorney Greg Brod is ready and able to help residents and visitors alike as a San Francisco cable car injury lawyer. This week, the San Francisco Chronicle published an article about the problem of cable car accidents and attempts by the city and the San Francisco Municipal Transportation Agency (“Muni”) to address the danger. The article focused on two recent accidents, each of which left a conductor seriously injured. On April 6, a 53-year-old c onductor was assisting passengers disembarking from a cable car on the Powell-Mason line when a car struck him, running him over and dragging him 10 feet. His injuries included bleeding in the liver, broken ribs, and a broken arm. Two months later, according to pending charges, a drunk motorcyclist hit a 50-year-old conductor from behind when the cable car operator was getting off the same line. The conductor remains in critical condition. Of course, conductors are not the only accident victims. 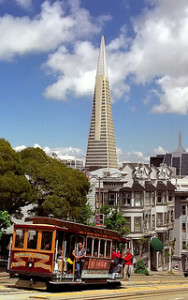 After the April 6 accident, Fox News ran a report focused on the financial impact of cable car accidents on the city, but also calling attention to the number of accidents involving the famous cable cars. According to the article, the city averages one cable car accident per month and reports 126 accidents in the past decade with 151 injured individuals. Federal numbers point to 19 injuries in 16 accidents last year, the highest in a decade. The problem certainly didn’t stop in 2015. In just one example, five riders and two workers were injured when a cable car stopped abruptly when it hit a small bolt on the track. In fact, the injury rate makes cable cars one of the most accident-prone forms of mass transportation in the country on a per mile basis. The Fox News report also looked at the financial impact of cable car accidents on the city. San Francisco spends millions each year resolving legal claims that arise “when 19th -century technology runs headlong into 21st-century city traffic and congestion.” Verdicts include $3 million awarded to a man whose foot had to be amputated after it got caught between the cable car he was riding and a parked vehicle and $4 million to four people hurt when a runaway car sped down a hill, eventually leaving the tracks and crashing into a sidewalk. In response to increased concerns about safety, Muni is erecting signage and issued a press release reminding drivers that passing a cable car that is loading or unloading passengers is illegal. The Chronicle reports that police will step up efforts to ticket those who violate this law and Muni is creating a program focused on reducing cable car collisions. A spokesperson for the agency suggested that visitors who don’t know the law are a major safety concern and asked the tourism industry to help with Muni’s driver education efforts. Cable cars are an important part of our past and, although few commuters use them today, they remain an important part of our city’s tourism industry. It is critical that safety be talked about and be an inclusive effort that involves the city, Muni, riders, and those who share the road with these old-fashioned conveyances. It is also important that those injured in cable car accidents are able to recover compensation when an accident is someone else’s fault. That “someone” can be a driver, a Muni employee, or even the city itself. Call if our San Francisco Muni accident law firm can help you.